Stay up to date with What's Hot in the world of real cider & fruit wines via our blog. Check out the delicious cider recipes below and on facebook - they taste great! Red Bank Cider was one of several fine food and drink businesses from Lancashire, invited by Marketing Lancashire to promote their produce in the House of Commons as part of their Taste Lancashire campaign on the run up to Christmas! With all that's going on, we thought they'd be ready for a taste of our cider and they loved it! 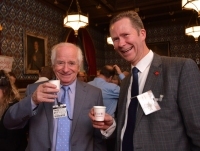 During the day, Lee - a former pupil of Haslingden High School a science buff since his school days met met TV presenter Johnny Ball, President. It was amazing to learn, having grown up in Bolton Johnny is a keen supporter of all things Lancashire. "Lovely" he commented whilst he enjoyed a taste of Red Bank's Autumn Orchard cider! As the Christmas festivities approach it was a perfect time for us to showcase our range of craft cider Christmas gifts and real cider boxes! Also at this busy time, as more online buyers are at risk of counterfeit products with health risks or tax evading fakes, it's reassuring for customers to know their cider is natural and authentic! As a local family business we're proud to "do our bit" for the community and what better way than helping the young people of Bolton get a better start in life. 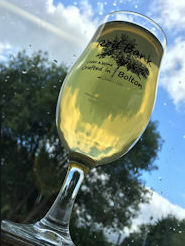 With the help of our customers, we've been raising funds from the selling of our "Crafted in Bolton" cider glasses. On Thursday 2nd August 2018 we were delighted to present a "big" cheque to Kelly McFadden - Fundraising Manager at Bolton Lads and Girls Club on behalf or Red Bank Cider. We look forward to continuing to support this great local charity which makes such a difference - and is often a lifeline to children and families in and around Bolton. Better than any mulled wine! This Christmas mulled cider is so easy to make! A gorgeous mulled cider recipe with wholesome ingredients will warm you up on a cold winters night, filling any room with the aroma of Christmas spice and cheer! Don't worry if you don't have all the ingredients, this recipe is adaptable to suit your taste! Add some brown sugar or Honey or Maple Syrup if required to taste. Warm up and very gently simmer a large pan of cider (with the lid on) with the spices for 20 minutes (don't over cook as the alcohol will start to boil off at temperatures over 70C) add honey or Maple syrup to taste. Pour through a sieve, place into in a flask if not serving straight away. Serve with a slice of orange! Tag @redbankcider in a photo of you and friends on Facebook enjoying your mulled cider! Mix a spoon of cinnamon and brown sugar on a plate. On a second plate pour 2-3mm of water and dip the rim of the glass in the water, then dip into the cinnamon and sugar. Add a few cubes of ice in to the glass with a few slices of pear and top up with Crackin Pear! Tag @redbankcider in a photo of you and friends on Facebook enjoying Crackin Pear! Watch the space - we'll soon be announcing the winning of the draw! Punchy Pimm's & Real Cider Cocktails! Nothing is more British on a sunny summer day than a refreshing glass of Pimms & Red Bank's Real Cider! A refreshing drink with a twist and personality! 300ml lemonade - or for champagne or Prosecco "Pimm's Royale"
SIMPLY THE PERFECT CIDER PIMM'S - this will make enough for a 1L pitcher plus a glass or two! Fill half of pitcher with ice, drop in the mint and chopped fruit and cucumber, pour in the Pimm's, top with lemonade and cider and stir. Keep the ratio to no less than one 5th Pimm's (to a quarter) 3-4 parts lemonade & real cider. Gordons Pink Gin Rosé Prosecco Cocktail Fill two large glasses with ice, add the gin, lemonade, top up with Rosé Prosecco, garnish with the strawberries! Top 10 - Most popular best selling Ciders with 5 Star Reviews! 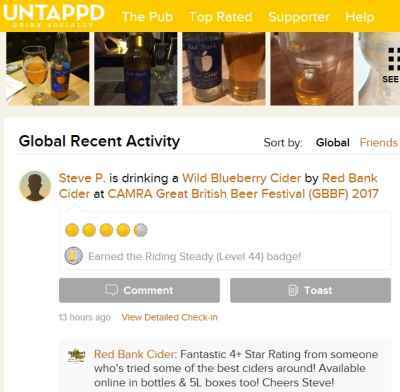 This interesting top 10 features a new entry at No.9 - a real cider plus Raspberry combo - which was the first cider to sell out at CAMRA's Great British Bear Festival 2017. Red Banks rather exceptional fruit combo ciders have only been surpassed this year by No.7's Cracking Pear & Elderflower leaping in this year with an exquisite combination of taste - perfect for any party! At position 6 - Red Bank Ciders - best of English Vintage Dry / still, remains popular with the serious cider lover - the low sugar option, it's dryness is reminiscent of a nice whiskey! At No. 2 & 3 Red Bank Ciders Medium Ciders are firmly in the top 3, whilst steady at the helm, Red Bank Ciders Admiral Rum flavoured cider is as popular as ever in No.1 leading best selling cider! No. 1: Admiral's Rum (bottle) - also available - Admiral's Gift Set with a Rum Cask Real Ale! Work Experience Day for Bolton Tower FM's Jon Holling! Tower FM Work Experience Wednesday! Bury & Bolton Business Finalists! 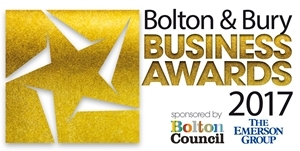 Red Bank cider were delighted to be Finalists in Bury & Bolton's Start-Up Business of the year -full details of the awards in the Bury Times and the Bolton Evening News! Congratulations to CAMRA on it's 40th Great British Beer Festival - several barrels of Red Bank Cider finest cider were well received at this, the UK's largest beer and cider festival. Two of our fruit combo ciders made with award winning Autumn Orchard were available on the bar and were the 1st ciders to sell out! Some great 4+ Reviews from the Great British Beer Festival were posted on Untappd.com for our Raspberry cider too! Autumn Orchard real cider is one of the best of the Red Bank Cider range to inspire you in the kitchen! Who would argue about swapping the wine for the finest real apple cider! Thirst Quenchers in Northern Life! Real Cider Producer & Wholesaler Tops 2000 Pints in a Week! 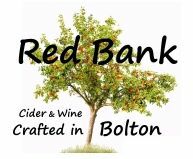 The last week in April 2017 saw Bolton & Bury based Red Bank Cider, selling an amazing 2000 pints of real cider in just 1 week! As a real cider producer and wholesaler we offer our festival customers sale or return - so they don't have to worry about running out of the good stuff! We were delighted all the local pub festivals were sold out before Bank Holiday Monday! It's been our busiest 4th year! Festivals help spread the word about real cider - most people in Lancashire haven't even tried real cider and are amazed when they get to try some of the best real cider around as it tastes miles better than they could ever believe! Everyone remembers a bad pint and many, including the younger generation are now getting wise to what is and what isn't proper cider; luckily good quality real cider (without artificials sweeteners and colours) has people coming back for more, so there's a growing following at festivals and on social media. 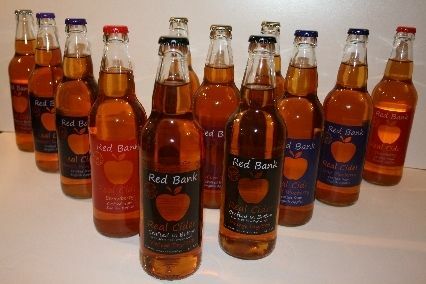 Red Bank's Real Ciders now have some top ranking real ciders with over 300+ independant ratings. Lots of independent 4 & 5 Star Ratings and real cider reviews can be seen on Feefo, Untappd.com, Facebook & Trip Advisor! Red Bank Cider in Madeira! Ever looking for the worlds best real cider, a holiday to the Island of Madeira wouldn't be complete without a trip to the welcoming mountain market village of Santa Da Serra. Known for it's Sunday markets and Festivals, and it locally made real cider, or Sidra as it's called in Portugese Madeira. There is a long tradition of Sidra making in Madeira, Sidra (Cidra is a Madeiran cake by the way) has been made for centuries in Madeira, with its rich volcanic soils and usually plentiful rain and sunshine it would be ideal for growing apples - apart from the almost relentless wind that is, which can devastate even the hardiest crops. Just over an hour on a No.78 bus takes you past the notoriously small airport runway high up into the hills to an unexpectedly large market, with dozens of small stalls including quite a few selling "Homemade" real traditional cider. A couple of small producers we talked to made around 400 Litres of real cider per year. The cider is pretty "zesty" in terms of acidity so it is best sweetened with sugar or the locally produced honey. If you love the dryest tartiest ciders, you can certainly find them here! Low sugar - you've got it! Photo - One of the best tasting was found at the stall above, nice medium cider with lots of fruity aromas and fruity tastes coming through. 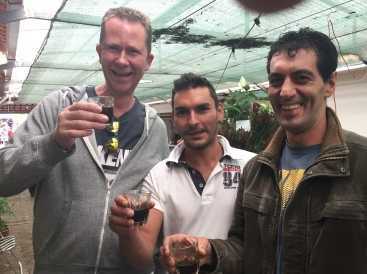 Photo - Lee enjoying a glass or two with local chaps Jolie and Lussi who's favourite local drink was Courtado - a hot Maderia Wine Americano Coffee! More details and photos of this Real Maderian Cider will be uploaded soon! 100 g of butter soft - walnut butter? In a casserole dish, pour a couple of tablespoons of oil and go back to high heat with the bay leaves. Put in the cleaned mussels and stir for a few minutes with the onion and minced shallot. As soon as the mussels are open, add a glass of raw cider and a beautiful walnut butter and the bouquet garni. Poach slowly for about 1 MINUTE (mussels should not boil as they will become rubbery). Remove the mussels in the skimmer and put them into a casserole dish or individual pots for serving. Slightly reduce the sauce on higher heat. Add the cream blended with the egg yolk, add pepper, simmer. Add the apple cut into julienne or into small cubes. 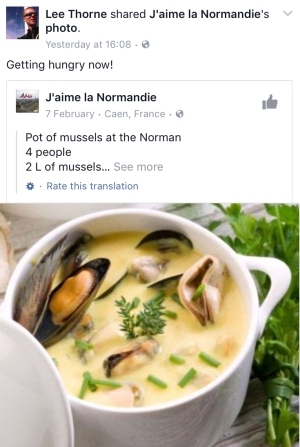 Pour over the mussels in the casserole dish or serving pots. The Pays d'Auge is in Normandy, between Calvados and Orne, the main town is Lisieux. and our customers have posted 30+ five star reviews on forums such as Facebook, Trip Advisor, and 130 Reviews on Untappd.com Feedback on individual products purchased is also building up on Feefo - Feefo ratings are as independant as they get - and cannot be bought online or on Ebay! We hope this'll give people confidence to give real cider a go! Many wine drinkers are really surprised how good our real cider is! Reading some of our customer reviews can leave our customers in no doubt that our cider is as good as we hope to make! We've also busy time with festivals this Spring & Summer - including the fantastic Last Drop Village 12th-14th August 2016 where the full range of Red Bank Ciders sold out! Other festivals include Bolton CAMRA's Beer Festival at Ukrainian Club, Little Lever Cricket Club, plus many more including Manchester CAMRA's Left Bank Cider & Real Ale Festival in July. It's a great way for clubs to raise funds and create a vibrant fun atmosphere! Our new ciders - Raspberry - is proving really popular - almost as popular as the Strawberry! Also we've received rave comments about our Crackin' Pear - Perry & Elderflower - lots "I want to buy some!" comments - this is a limited edition our late summer - click to reserve your box now! We've some new ciders "fresh out the barrel" so come down to Red Bank soon & have have drink with us soon! If you've never tasted real cider, then a visit to Red Bank is a must to try - free of charge our range of ciders! 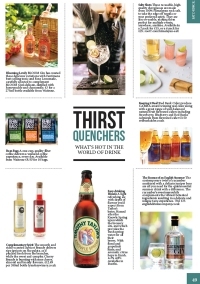 Many "non cider" drinkers are surprised to find that real cider is a nice alternative to their usual tipple! For example many real ale and lager drinkers like the double award winning Admiral's Rum Flavoured Cider. Cider and perry it is also a hit with many quality wine drinkers - and at half the abv its great with food too! 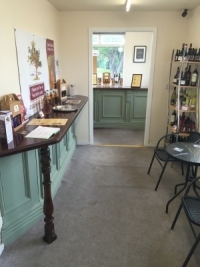 We hope to have several Meet the Cider Producer evenings in 2016 at Red Bank, but you are welcome to pop in to see us Fridays & Saturdays - we also have a great selection of wines and real ales! On a nice evening, what could be better than relaxing with a nice glass of real cider - try a few cubes of ice and a bottle of vintage dry cider! We'd love to see your own festival or cider YouTube review - please let us know and add it to our Feefo too! Once you've tried our cider, why not do your own review on google or facebook. 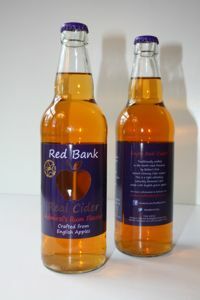 We have a monthly competition for the best photo featuring Red Bank Cider! Name the Cider with Real Radio XS - Win Cider & VIP Tickets! Early in 2015 Red Bank teamed up with Real Radio XS, Manchester, and Stockport Beer & Cider Festival. Red Bank Cider produced some very special real ciders including a Real XS cider which was named by the winner as "Scrumpin' Jack Flash". Steve Berry chose this seriously great tasting Red Bank Cider "still" cider with an ABV of 8% - smooth with a lovely cider apple aroma, and a nice after taste which will tempt you and wine lovers too! 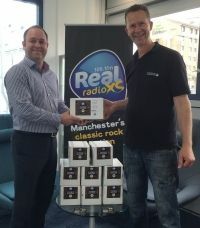 The winner received a box of cider and VIP tickets to the 29th Stockport Beer & Cider Festival.